The Predators Prospect Report is a monthly article in which I write about the state of the Nashville Predators farm system and how individual prospects are performing. I consider a player to be a prospect if he is younger than 25 and has accumulated fewer than 50 NHL games. We’re at the point in the hockey calendar when seasons are winding down. It’s a time when teams sign prospects – drafted or undrafted – and the Predators are no different. Since the last Predators Prospect Report (formerly known as Growing Fangs), general manager David Poile signed three prospects he drafted in the last three years. I’ll cover each of those players as I progress through this month’s top-10 list, which has little change in its order. 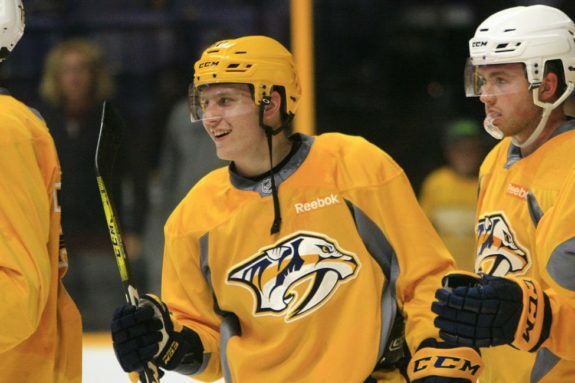 Eeli Tolvanen remains the Predators’ top prospect, even though he hasn’t played in the NHL since Dec. 11. He had a good month of March with seven points in 12 games, including a two-goal effort against the Chicago Wolves on March 30. Six of his seven points occurred in wins as the Admirals are red-hot after an 8-2-3 record in March. He’s still working on his defensive game, but he’s developing into a well-rounded player. His shot may have been what most impressed scouts ahead of the 2017 Draft, but he has shown great vision and passing ability in the AHL. Yet he still possesses that great shot, which he displayed in that two-goal game. On his first goal he had the puck in the high slot. He faked a shot, waiting for a shooting lane to open, and then rocketed a slap shot past Chicago’s goaltender. It’s unlikely he gets more time in the NHL this season, but as NHL roster spots open this offseason, he should have an inside track for a spot next season. Let’s get this out of the way early. 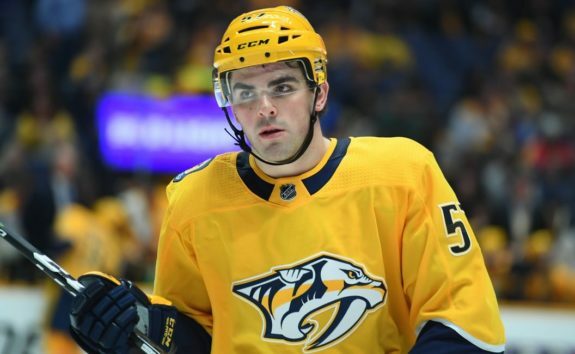 The moment many Predators fans were waiting for arrived on March 27 when the team’s top defense prospect Dante Fabbro signed. 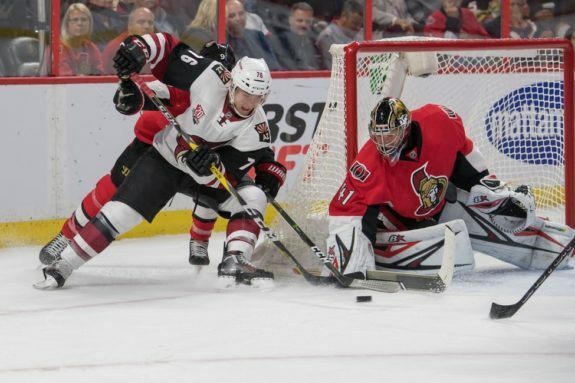 By signing his entry-level contract (ELC), it meant he is forgoing his senior season with Boston University and won’t become an unrestricted free agent (UFA) next summer. Fabbro wrapped up his collegiate career with a strong final month with B.U. In seven games, including four in the Hockey East Tournament, he had eight points. After the Terriers were ousted by Northeastern in the semifinals, he led an exodus out of Boston that also included Joel Farabee, Jake Oettinger and Shane Bowers. Fabbro traveled with the Predators to face the Pittsburgh Penguins before making his NHL debut at home against the Columbus Blue Jackets on March 30. On the third pair with veteran Dan Hamhuis, Fabbro played 16:12, went pointless, was a minus-one and had three shots on goal. He played 14:16 at five-on-five and 52 seconds on the penalty kill. He skated well, didn’t look out of place and made strong breakout passes, his best asset. I think it’s safe to expect him to have a full-time role in the NHL next season, so his time on this list is limited. Another prospect the Predators signed is forward Rem Pitlick. He had an excellent campaign and led the University of Minnesota in scoring for the second straight season. He was even nominated for the Hobey Baker Award as the nation’s top college hockey player. He concluded his great 2018-19 season on fire with seven points in his last five games. It wasn’t a guarantee that he’d sign, but in doing so, like Fabbro, Pitlick is forgoing his senior season. With him, the Predators are getting an undersized forward who can play center or wing. There isn’t much to not like about his game. He has great vision, is an excellent passer and can capitalize on scoring chances. He also knows where to be in all three zones, is strong defensively and provides support on the breakout. Upon signing his ELC, Pitlick joined the Predators for their game against the Minnesota Wild on March 25. He went pointless and had an even rating in 9:43 of ice time, all at even strength, and played on a line with Kyle Turris and Mikael Granlund. He was a healthy scratch versus the Penguins and Blue Jackets. With a full forward core, and Austin Watson getting recalled, there’s no guarantee Pitlick receives more playing time this season. Laurent Dauphin, whom the Predators acquired in February, continues to have a productive campaign in the AHL. In March, he had eight points in 13 games to give him 32 points in 55 games this season. All of his points occurred in Admirals wins. Having just turned 24, he is at the upper end of what I consider a prospect, but continues to have a fairly high upside. His problem will be earning playing time with the Predators given their full roster and the prospects ahead of him. I’ve gone back and forth with ranking Alexandre Carrier and the next player, Frédéric Allard, on recent lists. I ranked Carrier higher this month due to the incredible month of March he had with the Admirals. In 13 games, he had 11 points and now leads Admirals defensemen in scoring with 32 points. 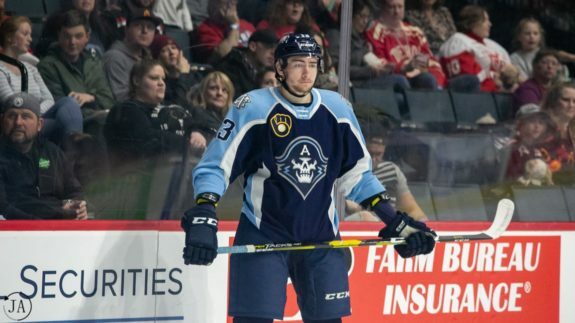 He had two multi-point games in March and was a major reason the Admirals closed the month on a five-game win streak, as he had points in each game. Allard dropped on my list after a forgettable March in which he only had four points in 13 games, including just one point in the team’s final 10 games. At only 21, he is still young with decent upside, but needs to be more consistent in all facets. Richard played one game in the NHL earlier this season, but it remains to be seen if he’ll ever develop into a full-time NHLer. At 5-foot-10 and 176 pounds, he may not have the size to transition to the big league. That being said, he capitalizes on opportunities and scores enough to perpetually be on the cusp of a call-up. He had a strong March with seven points in 13 games and had a four-game point streak between March 16 and 27. 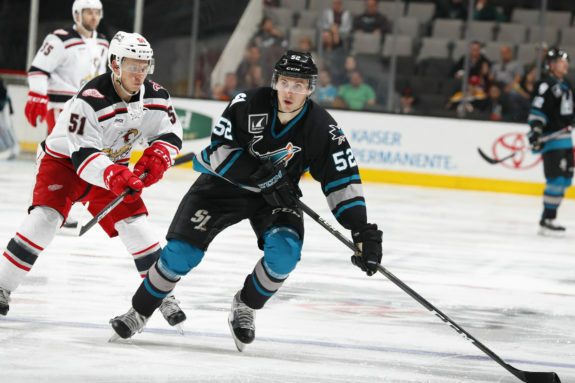 Yakov Trenin is developing into a quality two-way center in his third AHL season. He had a goal and six assists in 12 games in March and now has 30 points in 68 games this season, 25 of which are primary points. His defensive game is a skill NHL teams look for, but the biggest question will be whether or not he produces enough to get a serious look with the Predators. Jáchym Kondelík just wrapped up his freshman season with the University of Connecticut and had 26 points in 33 games. He only played two games in March, both victories for the Huskies, including an upset of second-ranked UMass, and had one point. That production may not be great, but he did win 23 of 30 faceoffs and excelled on a bad UConn team. I moved Kondelík up one spot from where I ranked him in February and wanted to move him ahead of Trenin, but couldn’t after only one collegiate season. Kondelík plays in all situations and has shown soft hands and a scoring touch despite his 6-foot-7, 218-pound frame. He has a path to the NHL, and seeing how his development continues in coming seasons will be interesting. If he follows up 2018-19 with an equal or better season in 2019-20, he could be a top-five prospect in the Predators system. Patrick Harper just wrapped up his junior season with Boston University, but it was largely a lost campaign with only 20 points in 38 games. That’s after he posted 37 points in 38 games as a freshman and 21 points in 20 games as a sophomore. He suffered an illness last season that limited his playing time and it appears that lingering effects from it carried into 2018-19. He began to pick up his play as the season progressed with four points in his final seven games, including two goals and an assist in the victory over UMass Lowell that pushed B.U. through to the semifinals of the Hockey East Tournament. Harper’s skills remain, and hopefully a full offseason will have him enter 2019-20 fully healthy. That will be his senior season, however, so it will be up to him to have a productive campaign in order to earn an ELC, either with the Predators or another team. The third and final college prospect Poile signed is forward Tommy Novak of the University of Minnesota. The Predators drafted Novak in 2015 and signed him after his senior season before he became a UFA. Mostly a playmaker, Novak had more assists than goals every season with the Golden Gophers. However, despite that, he has the ability to score and quarterbacked Minnesota’s power play. He finished the season with 21 points in 38 games for his lowest point-per-game rate in college, and added three points in five March games. Poile signed Novak to an amateur tryout contract and he reported to the Admirals. Since signing his contract, he’s played in two games with one assist. If he has a good showing the remainder of the season, he could earn a two-way contract in 2019-20. While Novak has some upside, he’ll need seasons of development in the AHL before reaching the NHL. He also needs to improve his two-way game as he was a minus-14 this season with Minnesota. The Predators’ last prospect at B.U., David Farrance developed quite a bit in his sophomore season. As a freshman, he played some at forward, but played this season on the blue line as Fabbro’s defense partner. Farrance accumulated 20 points in 38 games, more than double the nine points he had in 37 games last season. 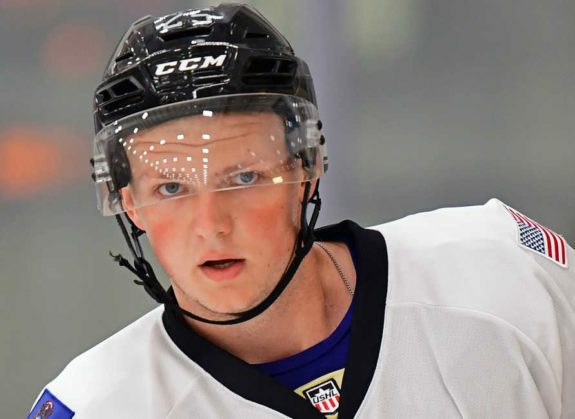 Although the shine has worn off some since the Predators drafted in the third round of the 2017 Draft, he’ll have plenty of opportunity to excel next season as an upperclassman on a rebuilding Terriers team. He finished the 2018-19 season strong with three assists, all on the power play, in his final seven games. If he works on his defensive game and becomes more productive at five-on-five, his potential remains that of an NHL defenseman. The second player the Predators acquired in the Dauphin trade, Adam Helewka is also at the upper end of what I consider a prospect at 23 years old. The former fourth-round pick has yet to reach the NHL, but is currently having his best AHL season with 45 points in 60 games, which leads the Admirals. Since coming over in the trade, he has 14 points in 19 games. In March, his scoring rate slightly decreased with six points in 11 games, but he did end the month on a three-game point streak. Helewka remains a fringe prospect, not just because of his age, but also because it’s unknown whether he’ll ever score enough to regularly crack an NHL lineup. Only time will tell if that happens or not, but he has been productive for the Admirals and could earn a call-up in the future. Defenseman Jacob Paquette, the Predators’ 2017 seventh-round pick, is in the second round of the OHL Playoffs after his Niagara IceDogs defeated the North Bay Battalion 4-1 in the first round. 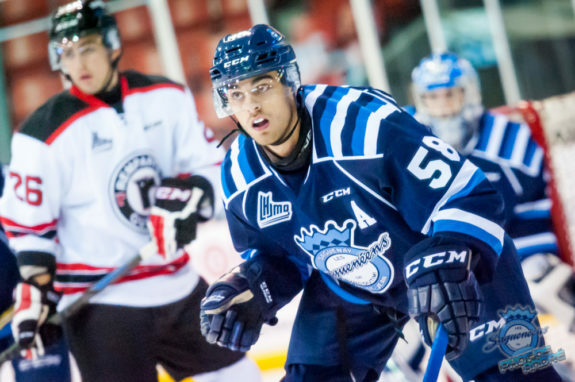 In his fourth OHL season, Paquette becomes a UFA if the Predators don’t sign him by June 1. His situation will be one to watch because he had a great second half of the season (3 goals, 23 points in 35 games) after the IceDogs acquired him from the Kingston Frontenacs.